With your Glock 31 chambered in .357 SIG you throw caution to the wind. Conventional gun safety rules be damned, you know exactly where your rounds are ending up. You think the police helicopters are out to catch a rogue speeder. Little do you know, you’ve shot six people in the last 5 minutes. Your showmanship comes from studying Colby on Top Shot. Your knowledge of ballistics, from watching Saturday morning cartoons and Sons of Guns. So crack open an ice cold Budweiser Mr. Bale-o-truth, because in federal prison only tears and tap water will wet your whistle. Lol, awesome post. I remember those Budweiser commercials, twas solid awesomeness. Didn’t realize what the big deal was at first. Then I watched it a second time and saw the cars in the background. We seriously need to chlorinate the gene-pool. I guess straw bales weren’t available… I hear they’ll stop nearly anything. Glad to see you’ve finally come to your senses and realized that cotton is, in fact, more bullet resistant than pretty much any other product on the market. It really helps to know that I’m just that good at debating. Which is fortunate ’cause I’m pursuing a law degree. Well, at least he wasn’t doing cup and saucer. Mike, if you’re going to do these, you have to get a band to record the song. haha it crossed my mind, trust me! Mike. This needs to become a regular thing. Yeah, I caught those cars the first time around. 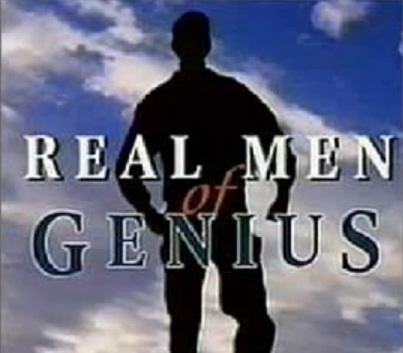 The “Real Men of Genius” was a superb theme! Yep. Been hearing this a lot lately. Apparently almost 20 years old is “new”. How do we survive as a species?? With people like this in the gene pool?? Your Haiku needs a little work. Lemme see if I can fix it. How did we survive so long?! Guys like this don’t help! While in this case it probably isn’t that bad (unless bullets will ricochet off of dirt), I can understand the concern. If the target was higher, cars would definitely be in trouble. In this case, the gun is pointed down enough I think people would be safe. Well, “probably” would be good enough for me if I were driving past and some dumbass with his first handgun were firing in the direction of the highway. It’s not “that bad” if you’re comparing it to blindfolding him, spinning him around, giving him the pistol and letting him plug away with no idea where he’s aiming. But if you compare it to something safe, like going to a range, or firing at a straw bale out in a rural area away from any cars, people, buildings, etc., then yeah, it is that bad. We’ve seen some examples of negligent discharges on here, I can easily picture this numbnuts doing so and putting a round up at the highway level. You have to take a basic firearms safety course before getting a hunting license; I think there are plenty of videos on YouTube that make me think you should have to do the same before purchasing a gun. On an unrelated note, I have an AWESOME idea for a new variant of “Pin the Tail on the Donkey” for my 8-year-old cousin’s Birthday party. We have rocks in our dirt. Some of them even sit on top of the dirt! I was shooting my 357 mag and .45colt over the weekend on a similarly sloped range with a bluff about 300 yards back. I could hear ricochets from both guns smashing into the trees at the bottom of the bluff, and half of them were not even jacketed bullets. Hardcast lead apparently bounces a long way too. Shooting toward the ground won’t always save you. As dry as we’ve been this year, it’s probably worse. I’ve shot 9mm, 357,45acp,40cal .308 .223, 12gauge…… at targets on the ground and I can say that anything at an angle usually cuts a 15ft divot and then begins to rise up again. This guy would pass as a perfectly good RO at some places. My in-laws neighbors do stuff like this. Using a plywood backstop, they think it’s ok to shoot directly towards my in-laws property. The bullets have to pass through the plywood and then some woods though, so its safe, right? Jerks. “My first handgun! Nice kick to it, eh? Pretty loud little baby cannon. It sure chews through those phone books! Using a tmj 125 grain round. Cokeman’s cousin has been found! LOL, I would paypal this guy $5 if he would say “All right you little F.g.ts,” on camera. i like how he says “new .357 sig cartridge.” that round is what, sixteen, seventeen years old at this point? dude should stfu, and stop endangering strangers. Next post: Whose Gun Is It Anyway?